This is a really tasty brunch item that I learned from my friend Divya.. I went to Divya's place after work one day and I was really hungry.. we were chatting over a cup of tea.. and Divya offered me garam garam parathe.. proper layer wale, loaded with ghee etc etc paranthe.. I was completely impressed by the simple recipe and the fresh namkeen taste.. also, I learned a new way of making parantha with layers... so here it is..
Make a roti out of the aata.. and spread oil on the roti, sprinkle namak, mirchi powder, jeera powder. A pinch of ajwain on top. 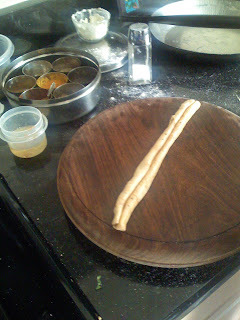 Mix the spices on the roti with hand. Bas!!.. make the parantha (D puts a lot of ghee on it when roasting) and enjoy the delicious brunch with chuttney, achar or best is desi dahi with jeera powder.. Thanks for drooping by!! 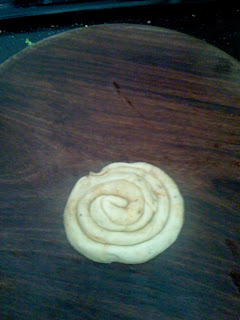 Your way paratha making is really cool. I loved the filling used. I just have it with curd...tastes gud n so simple..
wow..this recepie is very simple .i am going to try this soon.Thanks for posting anuja. Thank you for the comments Sujata! 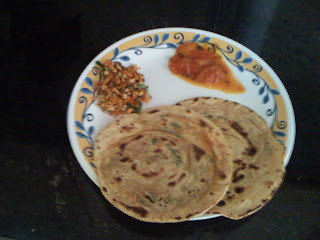 I tried this paratha,,very delicious and so easy to make..just had it with pickle and curd.. I have been searching for this recipe since ages. Thank u so much..... trying it now. Hope you liked the results!